Bridal lehenga- check, jewellery-check, wedding favours- check, but what about your sangeet songs? Are you yet to decide the songs on which you and your tribe will rock the dance floor on the day of your sangeet? No matter how much you love tapping your feet to the videshi numbers but deep down you know that your wedding is incomplete without some Bollywood tadka. 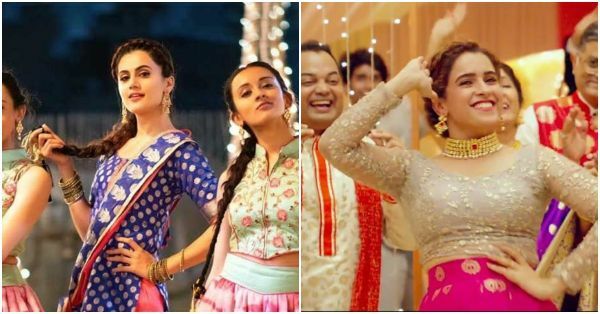 To add the much needed dose of Bollywood songs to your sangeet function, check out this list of all the hindi songs from 2018 that will be just perfect for the occasion. This Punjabi song is already the official sangeet song. Your guests are gonna love a solo dance on this by the bride. Get all your veeres together and shake a leg on this dance number from Veere Di Wedding. What a crazy song to set the stage on fire. Another great sangeet song for an energetic performance. Dance with your soon-to-be husband on this one and get ready for hoots and whistles. This song also makes for a fun family dance performance. Haven't heard this song yet? Go, do it now. This is such an underrated Bollywood song for a dhamaal sangeet performance. Dance with your bridesmaids on this for a fun twist to the celebration. This is the latest entry on our list of best sangeet songs and God, what a number this one is! But girl, you need REALLY high levels of energy for mind-blowing sangeet performance on this. So get your dancing gear on and start practising. This is something ONLY and ONLY for your BFF and her boyfriend or maybe that cute guy at the wedding she has a crush on. Cheer your favourite couple as they tap their feet to this cute song from Kedarnath. Another peppy Hindi song for you and your girl gang. Dance your heart out as this is the best way to flaunt your happiness on your special day. We are in love with these songs. We still feel there are more that can be added to this list. What are your favourite sangeet songs from 2018? Let us know in the comments.